Here’s an important question for you: just how often do you check the air pressure in your tires? Now, there is a good chance that the answer to this is “not all that often”. Most drivers don’t really pay too much attention to their tire pressure because they don’t realize how important it is. However, if you want your car to be able to drive smoothly and safely, you need to check the tire pressure regularly. In fact, you need to properly check the air pressure at least once a month. This will help you to ensure that the tires aren’t over or underinflated. One of the reasons that drivers don’t get the tire pressure checked as often as they should is because it means driving to a service station to do so. Few people have the time to actually do this. Well, the good news for you is that you can now have an easy-to-use digital tire gauge in your own home. This makes the process of checking the pressure a lot easier. In case you aren’t sure which one you should choose, here you will find a list of the best digital tire gauges available. We will also look at some of the tips that you can follow when choosing your own. Accuracy: the main point of a digital tire gauge is to be as accurate as possible. This will give you a good idea of whether or not your tires are properly inflated. Now, by itself, you can’t really determine the precision of a gauge. You will need to test it against a pressure gauge that has already been established. Usability: one of the perks of using a digital gauge is that it is supposed to be easier to use than another mechanism. So, we took into consideration just how easy it was to use each of the devices mentioned in our list. Ergonomic factor: or you to be able to use the gauge properly, you will first need to find it easy to hold. We looked into how comfortable each gauge was to hold and maneuver, even in colder weather. Display: it doesn’t really matter how accurate a pressure gauge is if you can’t actually see any of the readings. This is why we carefully examined how easily we could read the display in various types of light. Why we like it: If you are looking for a pressure gauge that is accurate but has a very low learning curve, then the Cooolbuy model is for you. It offers you everything that you are looking for in a tire gauge. One of the first things that stand out about this digital gauge is the fact that it offers four different reading ranges. You can choose to view your readings in psi, bar, kg/cm2, or kPa. So, regardless of what system you are comfortable with, you can change your settings accordingly. As a result, you will be able to understand the readings a lot more quickly. It will also only take you a short time to change the settings to what you prefer. The maximum reading available with this gauge is 150 psi and 10 bar, which is more than enough for most vehicle tires. The one thing that you can’t deny is just how easy it is to use this gauge. Even if you aren’t used to this type of device, you will learn quite quickly. For instance, the grip has grooves that perfectly fit the way that your fists close around the handle. This allows you to get a good grip on the gauge. Also, the valve immediately forms a tight seal around the tire the moment it is pressed against it, letting you get your results that much faster. It will just take one glance to figure out what the readings are since the backlit display is easy to read both during the daytime and the night. As the numbers are incredibly accurate, you can trust what you are seeing. The Cooolbuy gauge is equipped with an auto shut off function that allows you to save the battery life. Unfortunately, this does take a while to kick in which can mean that your battery is draining more than you would like it to. You also get to enjoy a lighted nozzle that makes it easier to see if you are working in the dark. Why we like it: The Rhino USA Digital Tire Pressure Gauge is a precise device that offers up a number of readings while also being simple to use. 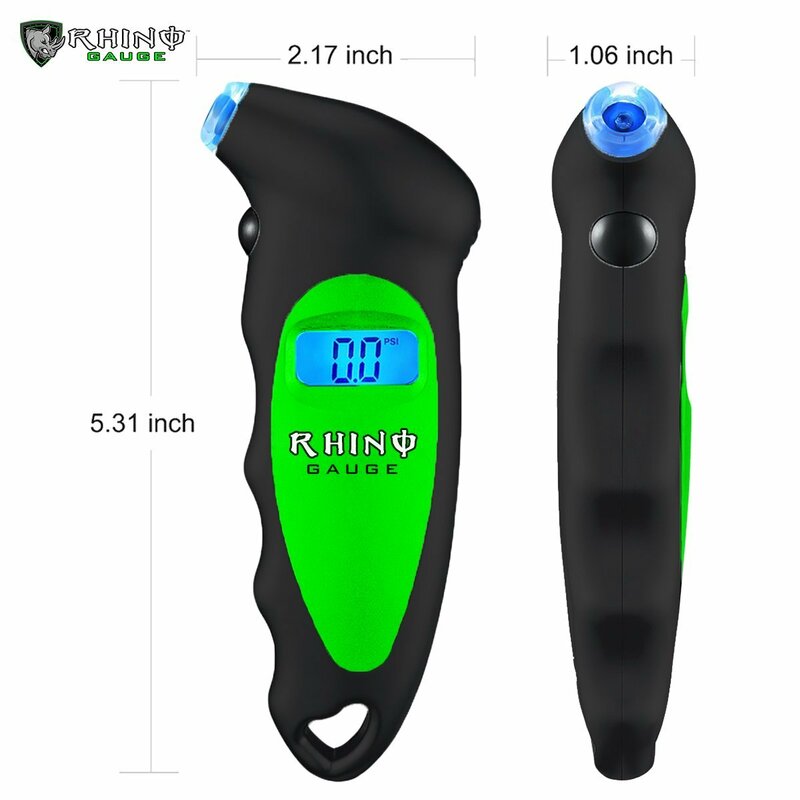 If you want a tire pressure gauge that will make reading your tire pressure incredibly simple, then you should definitely consider getting the Rhino USA model. Now, it doesn’t matter where you are in the world, you will find it very easy to read the readings provided by this gauge. Why? Well, you can choose from four different types of ranges – psi, bar, kg/cm2, and kPa – so that you don’t have to work out any conversions. To get to the settings that you want, you don’t have to fiddle around with loads of buttons as there is just one that you have to press. The gauge is able to provide maximum readings of 150 psi and 10 bar so you are covered with almost any vehicle that you want to use it with. In terms of how well this gauge works, you will be pleased to know that it provides you with accurate readings each and every time. 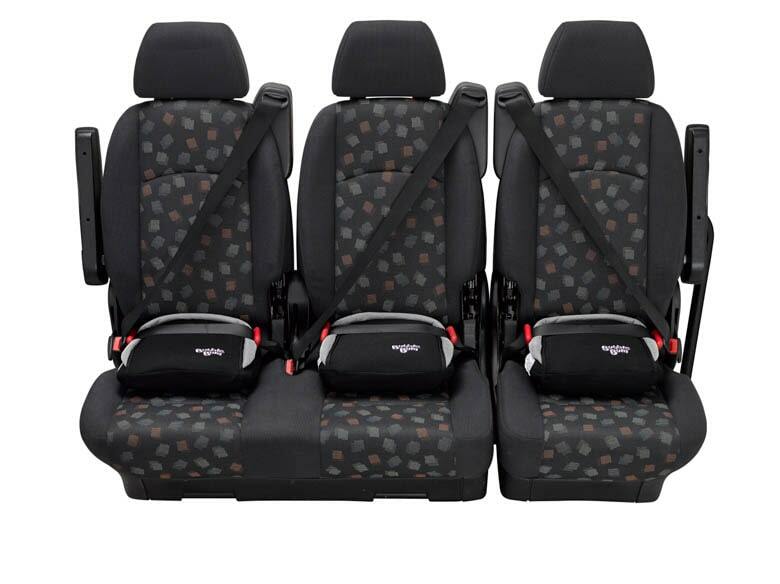 It has been tested under strict conditions and continues to be reliable. This means that you never have to doubt what you are seeing on the display. To top it off, all the settings on this gauge can be managed by a single button. So, just by clicking it, you will be able to quickly get into whatever mode that you desire. This makes it particularly easy to use this gauge at night when there isn’t enough light to figure out buttons. Speaking of which, the gauge has a backlit display which means that you are always treated to clear readings. One of the features that you will be quite grateful for with this gauge is the fact that it comes with a lighted nozzle. This way, you will be able to see precisely where you are placing the valve against the tire. Unfortunately, the Rhino USA gauge doesn’t have the auto shutoff feature which means that you have to manually turn it off after using it. 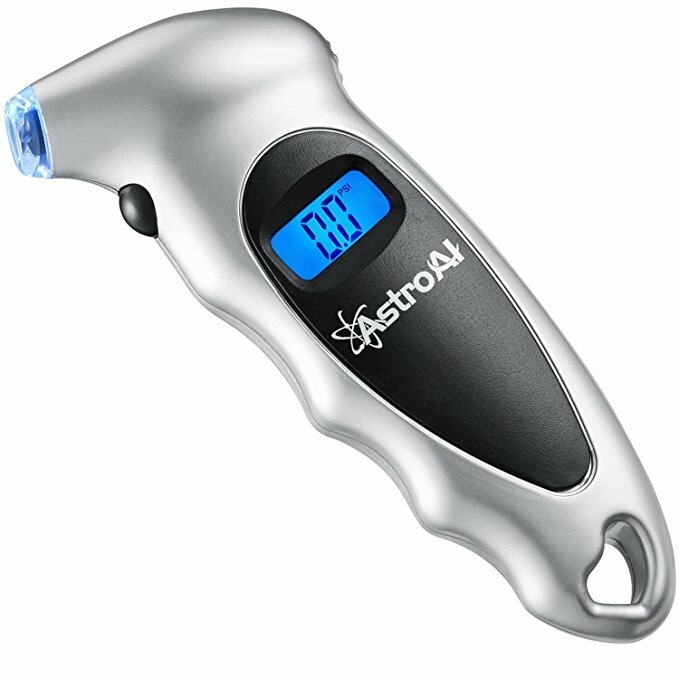 Why we like it: The AstroAl Digital Tire Pressure Gauge is easy to work in all conditions, making it a handy to tool to have in any circumstance. The AstroAl pressure gauge is a reliable option to keep in your car or have around your home. You will be able to always be able to precisely determine the air pressure in your tires. The AstroAl gauge provides you with four different readings including psi, bar, kg/cm2, and kPa. This makes it a universal gauge that can be used by practically anyone. See, it doesn’t matter what pressure readings you are familiar with, this gauge ensures that you will not have to worry about conversions ever again. So, what exactly are the minimum and maximum readings available with this gauge? Well, it is able to detect 0 – 150 psi, 0 – 10 bar, 0 – 10 kg/cm², and 0 – 1000 kPa. So, as you can see, it is well-equipped to take readings from a wide range of vehicles. The other thing that is impressive about this gauge is its level of accuracy. Give or take, the readings will be accurate up to 1 percent. Compared with many other pressure gauges on the market, this model certainly beats out the competition. With just one button in place, the settings on this gauge are very intuitive. So, even if you aren’t great with technology, this device will prove to be a breeze to use. This is especially considering that the backlit display is incredibly easy to read. The only minor complaint regarding this gauge is its construction, which feels a bit cheap. Now, this doesn’t affect its functioning at all but it does cast doubts on its durability. Perhaps the most notable extra feature on this device is the lighted nozzle which gives you the chance to properly use the gauge at any time during the day. The gauge is also equipped with its own auto shutoff display which goes a long way in helping to conserve and preserve the battery. Why we like it: The Ionox ION-15S Pressure Gauge is a durable product that ensures you get accurate readings each time that you use it. If your main goals are to have a pressure gauge that provides you with highly accurate readings while also ensuring that it will last you a long time, then this is the model for you. With the Ionox, you don’t ever have to worry about being confused about the readings that you are seeing. This is because it doesn’t matter what pressure unit system you are used to, this gauge caters to them all. You will be able to see your readings in either psi, bar, kg/cm2, or kPa. The Ionox ensures that you will be able to see readings that are both low and quite high as well. On the lower end of the spectrum, this device will detect pressures as little as 0.5 psi. On the higher end, you can see readings up to 150psi, 1000kPA, 10 Bar, or 10 kg/cm2. 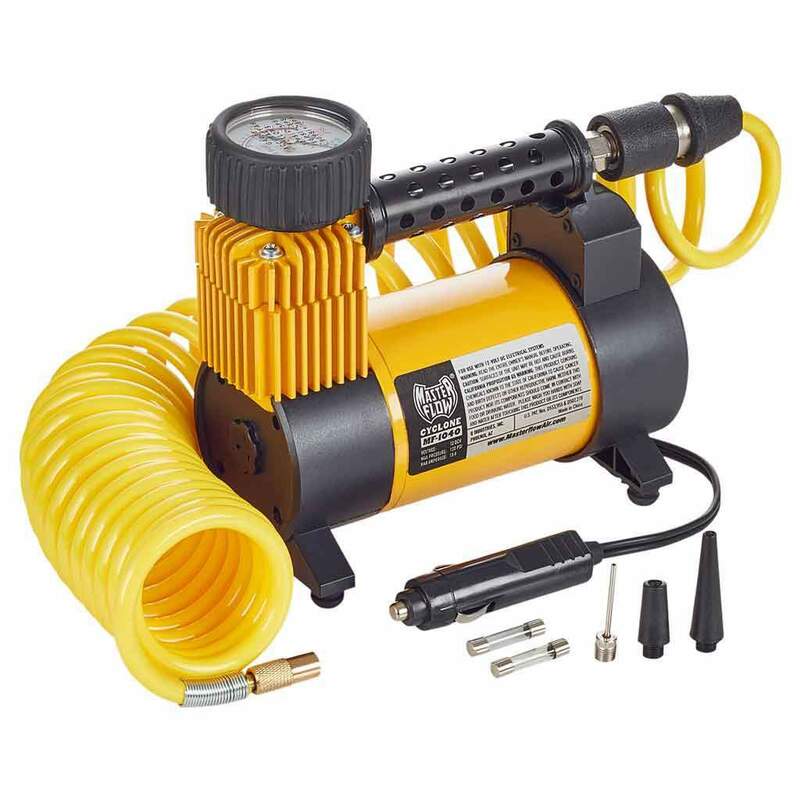 There is no denying that you will be hard-pressed to find a pressure gauge that is easier to use than this model. This is because all you need to do is press a single button that will let you get to any setting that you want. To top it off, the button is located unobtrusively on the gadget. While this is a small and compact tire gauge, it doesn’t have the same level of ergonomic design as the models above. However, it isn’t all that difficult to hold onto it or use it. However, the level of accuracy – +/-0.5 PSI – more than makes up for this. Also, the readings appear on a well-lit display. This is definitely a tire gauge that you can use in emergency conditions. This is because it comes with a lighted nozzle that makes it simple for you to properly line up with the valve on the tire. The Ionox gauge also comes with its own shutoff feature. Unfortunately, this tire gauge shuts off quite fast which means that you have to look at the readings immediately. 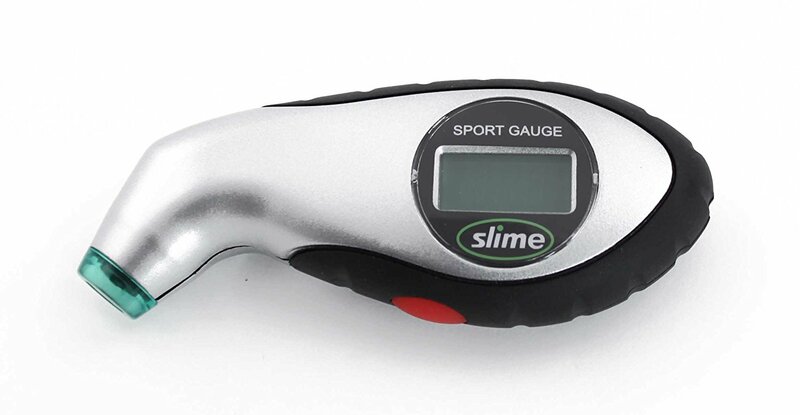 Why we like it: The Slime 20017 Digital Tire Gauge makes it easy to get multiple, accurate readings within a short period of time. The Slime 20017 allows you to take consecutive readings to ensure the accuracy of your initial readings, making it ideal for times when you need to be very precise. Now, this gauge doesn’t offer as many readings as the previous products mentioned. However, you are still able to choose from psi, kPa, and bar. This should be more than enough for most people, regardless of the pressure measurement system that you are familiar with. You are able to get both low and high readings with this gauge which makes it versatile enough to use with different kinds of vehicles. It is also quite easy to adjust the settings for the various ranges as you just have to press a button until you find what you are looking for. One of the things that makes this digital gauge a bit different from the others is that it comes with a reset button. So, why is this important? Well, it gives you the chance to reset the gauge back to zero before taking another reading shortly after. This helps to prove the accuracy and reliability of the gauge. The well-lit display makes it easy to quickly read the numbers in all kinds of conditions and lights. This is certainly a comfortable gauge to use. It has a rubberized grip all along the curve of the handle which allows you to get a good grip on it. The only downside to the design, however, is the main button. It is oddly placed which means that you are likely to press it while trying to hold the gauge. This can make it a tad bit difficult to work. The lighted nozzle makes it quite easy to see whether you are using the nozzle in the correct manner against the valve. Also, because the light is so bright, it works well even in the darkest conditions. There is also an auto shutoff feature to help you save the battery. Why we like it: The Craftsman Digital Tire Gauge makes it easy to know if your car tires have been pumped up to their specifications. If you want to make sure that your tires are pumped up to the level that has been predetermined for them, then this is the gauge to do it for you. 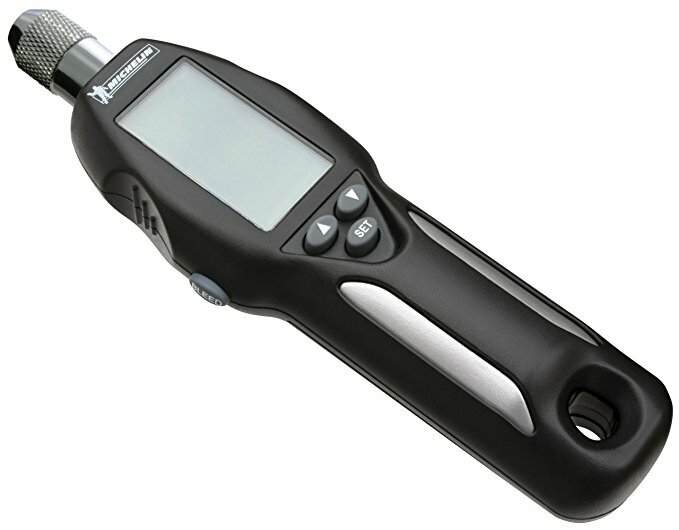 With the Craftsman gauge, you are only able to see the readings in either psi or bar. However, since most people are familiar with this measurement systems, it should be a good fit for many. What sets this model apart though, is that it is programmable. This gives you the option of programming the gauge to remember what your ideal air pressure should be (this information is available in your owner’s manual). So, the next time that you measure the pressure, you will determine if you are within the right range for your car. The Craftsman gauge is thin and streamlined, ensuring that it will fit in most people’s palms. It also makes it easier for you to angle the gauge anyway that you want. So, if the valve is in an odd position, you will still be able to get your reading. Now, the display is well-lit so that you will be able to see the readings even in poor lighting conditions. However, you don’t have to keep an eye on the gauge for the whole time as it will beep to let you know when a reading has been completed. 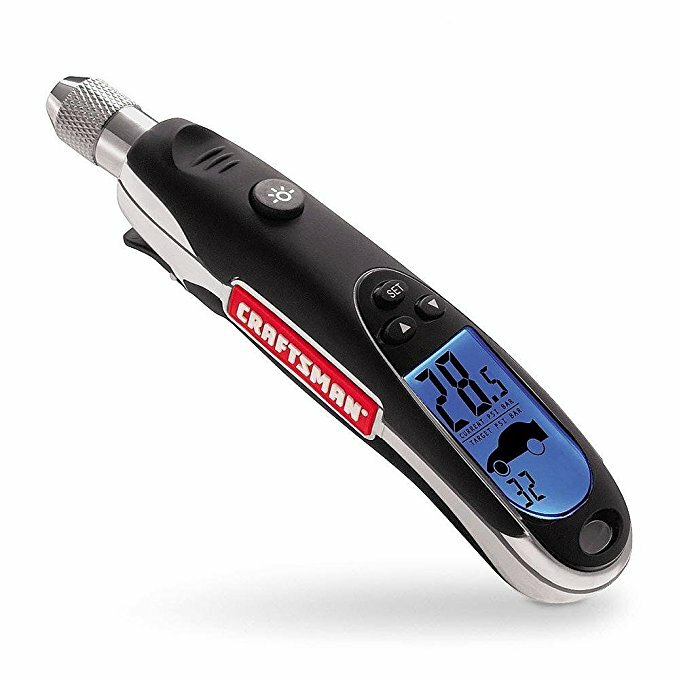 The Craftsman tire gauge doesn’t have a lighted nozzle but it does have a flashlight function that you can use instead. This will allow you to clearly see what you are doing, even at night. The gauge also doesn’t have an auto-shutoff feature so you will need to do it yourself. 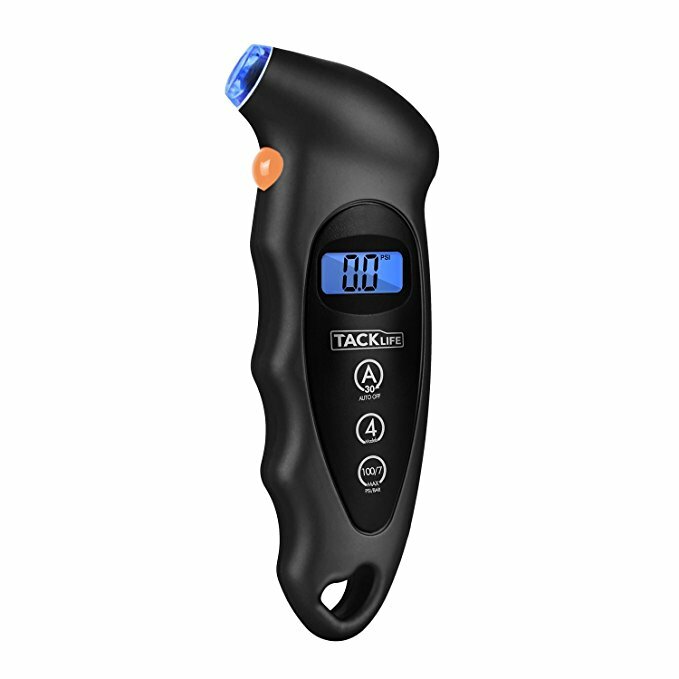 Why we like it: The Tacklife TG-01 Classic Tire Pressure Gauge allows you to get a variety of readings quickly and accurately, with just the touch of a button. If you want a fuss-free tire pressure, gauge then you will find that the Tacklife TG-01 gauge is one of the best options available to you. The Tacklife gauge allows you to choose the pressure measurement system that you are most comfortable with, regardless of what you are used to using. So, whether you want your readings in bar, psi, kPa, or kg/cm2, you will be able to get it within moments. Unfortunately, you are only about to get as high as 100 psi or 7 bar on this gauge. You don’t have to fiddle around with various buttons and settings to be able to get these readings either. There is just one main function button that allows you to reach any setting that you need within moments. This quickens up the whole process. As far as design goes, there really is no faulting this gauge. It has been built to fit your grip perfectly, making it incredibly easy to use in all conditions. Also, the button is conveniently placed away from where you keep your fingers so you can’t accidentally change the settings. It also fits onto most valves incredibly well, providing you with the readings that you need quickly. The backlit display makes the numbers very clear to see whether you are trying to read them in bright sunlight or pitch darkness. The nozzle on this gauge is illuminated so that you will never have any trouble figuring out how it needs to fit onto the valve. As a bonus feature, there is also an auto shutoff function that kicks in shortly after you are done using the gauge. So, you will be able to conserve the battery even if you forget to turn the gadget off. Why we like it: The Accutire MS-4021B Digital Tire Pressure Gauge is rugged and simplistic in design, ensuring that it will last long. This Accutire tire pressure gauge is definitely good for anyone who wants a device that is simple to use but still a worthy investment. 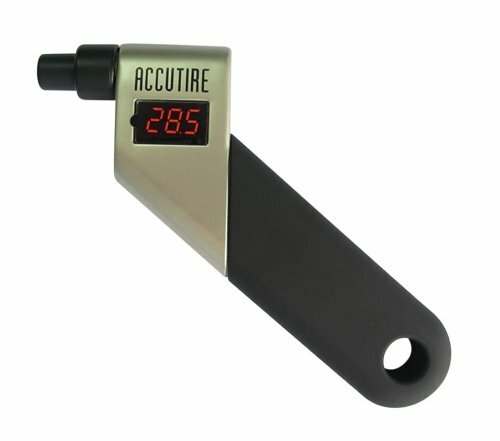 The Accutire tire pressure gauge only offers readings in psi. So, it will only have any use for someone who is familiar with this form of measurement. Since it is relatively common, most people will be able to use this model. Now, it will provide you with readings ranging from 5 to 150 psi, which should work for most vehicles that you may own. The readings have an increment of 0.5 pounds. The gauge offers up an incredible level of accuracy – within 0.5 psi. It really doesn’t get any simpler than this pressure gauge. It has been angled in such a way that you will be able to place it on the valve in any way, and still keep a good grip on the gauge. This is good since it does a second or so for the readings to appear. Although it is not very bright, this pressure gauge does come with a backlit display, allowing you to see the readings in most kinds of lights. Perhaps what really sets this device apart from the others, though, is the fact that it is so durable. It will undoubtedly last you for years to come. In terms of additional features, this gauge doesn’t boast too many. It does, however, have an auto shutoff function. So, once you have seen your reading and dislodged the gauge from the tire valve, the screen will automatically turn off. So, you will be able to conserve your battery for longer. 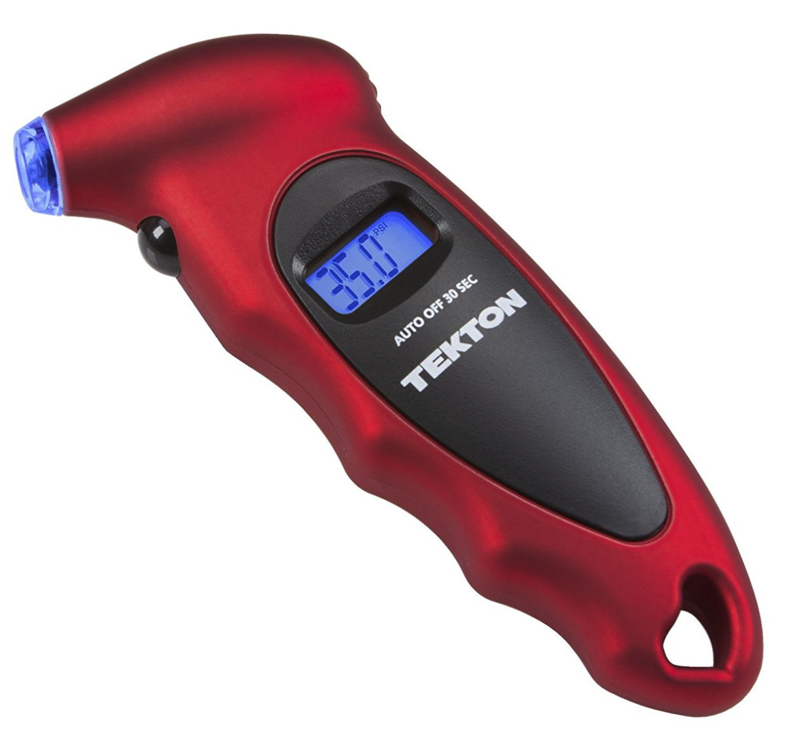 Why we like it: The TEKTON 5941 Digital Tire gauge is a good device thanks to its versatility in reading ranges and its simple user interface. The TEKTON 5941 makes it a lot easier for you to quickly yet accurately get your tire pressure readings. The TEKTON allows you to choose from kg/cm2, kPa, psi, and bar when getting the readings on your tires. Due to this, you will find it easy to use in any country in the world. Not to mention, you won’t have to resort to converting the numbers and arriving at an incorrect estimation. The only minor disappointment here is that the maximum pressure isn’t all that high at a 100 psi. Of course, since most consumer-owned vehicles don’t require so much, this will not prove to be a problem for most. If you have a heavier vehicle or drive larger loads, though, it may not be sufficient. This pressure gauge works like a charm as it is really easy for you to choose from all of the settings available to you. It also works quite quickly so you will be able to see your readings in a flash, allowing you to check all four tires quickly. The design of the pressure gauge has also been well-executed. It offers up an ergonomic grip that makes it easy to hold. You will also find it quite easy to angle the gauge in a way that it is easy to press it up against the valve. The backlit display ensures that you will be able to see the readings in all kinds of conditions. If you want to use this tire gauge late at night, you don’t have to worry about being able to place it against the valve in the dark. This is because it has a lighted nozzle, illuminating everything for you. There is also an auto shutoff feature that allows you to save the battery. This is a good thing considering that changing the battery on this gauge can be incredibly difficult. Why we like it: The Michelin MN-4535B Digital Programmable Tire Gauge has lots of great additional features that make it great for car-savvy people. If you want a tire gauge that is able to offer you something extra, then you will find the Michelin pressure gauge will get the job done. So, you will only be able to choose from psi and bar with this pressure gauge. Of course, this is exactly the measurement system that most people rely on, so it shouldn’t be too much of an inconvenience unless you are familiar with a different system. Also, this gauge only provides maximum readings of up to 99 psi or 6.85 bar, which is the lowest on this list. 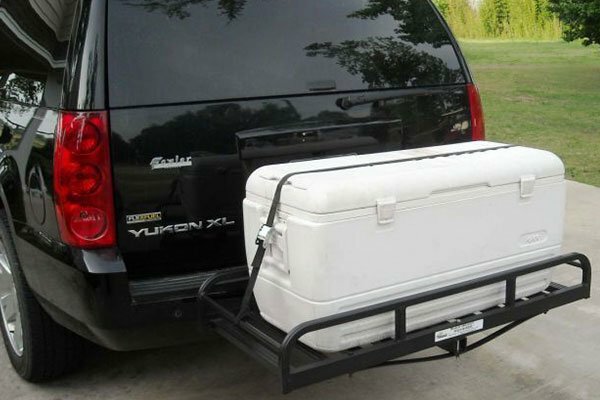 If you drive a smaller vehicle or don’t really carry too much load, you should be able to work with this. The Michelin gauge makes up for all of this, though by being programmable. You can save your car tires’ recommended pressure and check it against every reading that you take. Now, one thing you will definitely notice about this gauge is that it is not compact. It is large so you may not be able to carry it around in your car. However, its size is also what makes it easy to hold and handle as you are able to get a better grip. The display is large so that you will always be able to clearly see the readings. It also has a backlight that allows you to use it any lighting conditions that you want. One good way that this gauge is different from the others is that it comes equipped with a bleed valve. This comes in handy if the readings say that your tires are overinflated. The bleed valve offers you the opportunity to slowly let some of this air out until it reaches the desired pressure. It also has an auto shutoff function although it lacks a lighted nozzle. Here we will look at all the things that you should consider before choosing your own digital tire gauge. The most important feature in a digital tire gauge is whether it is able to provide you with precise readings. Why is this so vital? Well, when your wheels have the right amount of air in them, you can ensure that you are driving safely and even that you are saving money on fuel. However, if your gauge doesn’t perform properly, you will not be able to tell whether your tires are underinflated. This can mean that your tires will wear out quite quickly and will need to be replaced much sooner. Not to mention, there could be a higher risk of an accident. As mentioned, it isn’t always easy to determine the level of accuracy by yourself. However, most manufacturers will provide you with their testing results. You should look for gauges that offer between 0.1 and 0.5 psi accuracy for the best results. Sometimes, it isn’t the pressure gauge that is at fault – you are simply not checking the pressure the right way. So, what is the best way to check your tire pressure? Well, first things first, you should only ever take readings when the tires are cold. If you try to do this while you have been driving around for a while, you will find that the readings are considerably higher. So, you will need to wait until the car has been stationary for a while and has had time to cool down. You will find that most brands of digital tire gauges offer psi readings between 100 and 150 psi. This roughly translates to about 7 to 10 bar and 700 to 1035 kPa. This is often more than what is recommended for many vehicles. So, as long as you stick with a gauge that is able to provide these readings, you should be fine. That being said, you should always first check your owner’s manual. This will give you a better idea of just how much your tires need to be pumped up and thus, what readings your gauge needs to provide. Often, with larger vehicles, particularly load-bearing ones, the tire pressure may be higher. 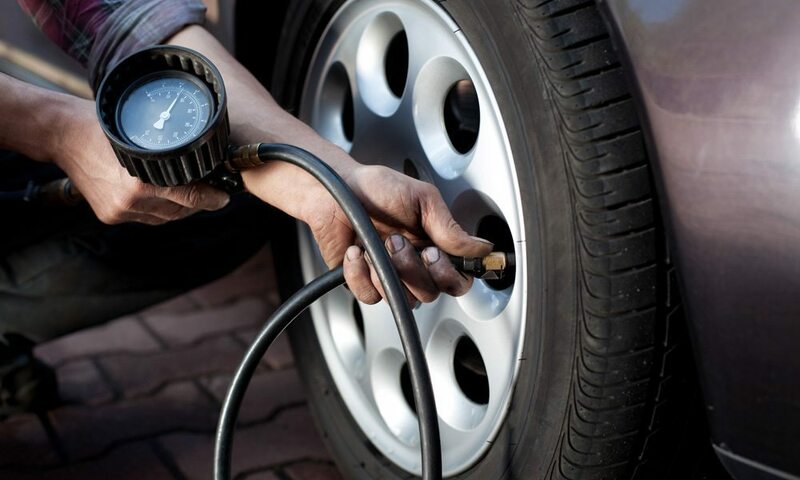 You may want to check your tire pressure at odd times, particularly if you are in an emergency situation and need to know if your tires are inflated enough. This could happen during the day or at night. This is why your gauge should be well-lit. Ideally, you should look for gauges with large, backlit displays. The illumination will ensure that the numbers show up in all kinds of light. Similarly, it can really help if the nozzle is lighted as well. This way, you won’t need to shine any other form of light on the tire to locate the valve. You will also be able to get your readings a lot quicker too. The reason that the design of the tire gauge is taken into consideration is that it can determine how easy the pressure gauge is to use. So, first, the gauge should be able to comfortably fit in your hand. Women or people with smaller hands should look for smaller, more streamlined models for this. You should also be able to get a good grip on the gauge. This will allow you to hold it in place comfortably, while it is attached to the valve. It will also decrease the chance of the gauge slipping and dropping to the floor. It is a good idea to pay attention to how the buttons on the gauge are placed. It should be away from where you intuitively place your fingers. See, if it’s close to where you grip the gauge, you will unintentionally keep pressing the button. This will mess with the settings which means you will have to start all over again. Since you want your tire gauge to last you a long time, you should first check that it is made out of high-quality materials. This way, even if does get dinged around a bit, it will still continue to work. So, make certain that all the parts have been welded or fastened together properly. At the same time, you should look for a gauge that is suitable for the weather conditions you face. Most pressure gauges have been designed to last in very cold or very warm conditions. However, if you live somewhere the temperatures drop well below freezing, you will need to check that your gauge can withstand that kind of weather. If not, you will need to keep it indoors rather than carrying it around in your car. 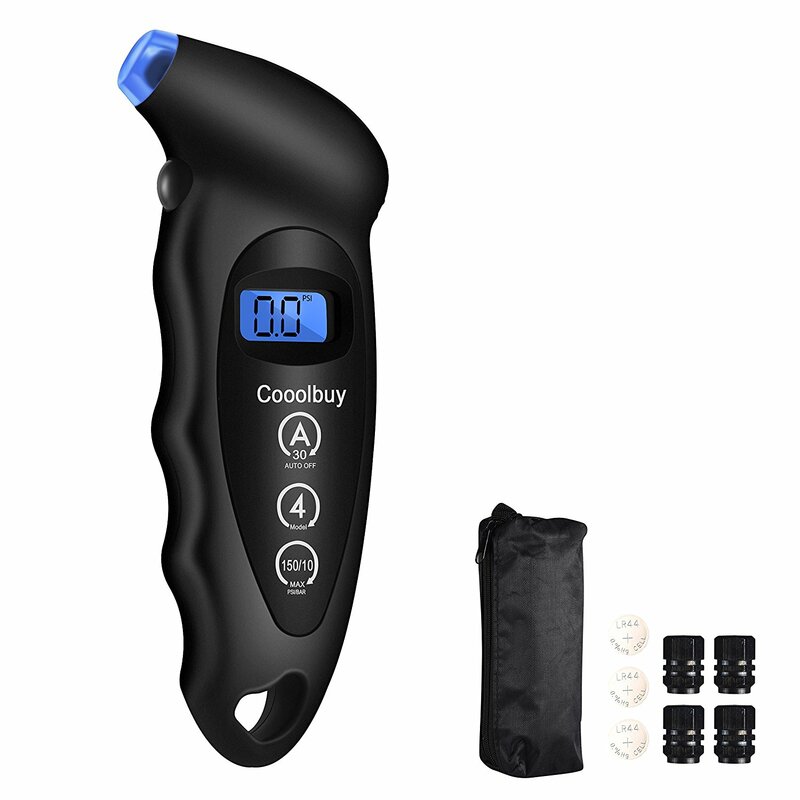 If you are looking for a tire gauge that offers just a little more in terms of features, you are probably wondering what to look for. Well, one thing that you should definitely consider is the auto shutoff function. This has become so common that it is practically a basic function rather than an additional one. The reason such a feature is useful is that it helps to save your battery. Most gauges with this function are able to turn off less than a minute after you have used them. So, even if you don’t remember to do it yourself, the gauge will take care of it for you, cutting down on the battery consumption. It can also be helpful to have a programmable device. This way, you will be able to dial in the ideal pressure for your vehicle. So, every time that you check the air pressure on your tires, you will be able to see just how close or far away it is from the best pressure. Therefore, you won’t need to keep consulting your owner’s manual. If you are confident in managing the air pressure of your tires, you may want to look for a gauge that has a bleed valve. This way, if you do find that the pressure reading is too high, you can use this feature to let the air out a little. This concludes your journey to look for the best digital tire gauges. Hopefully, you have found one that suits your needs or at least you now know what to look for.